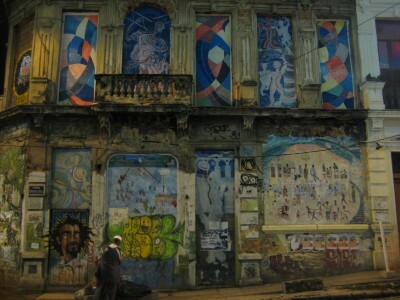 Lapa is a neighbourhood in the city of Rio de Janeiro, in Brazil. 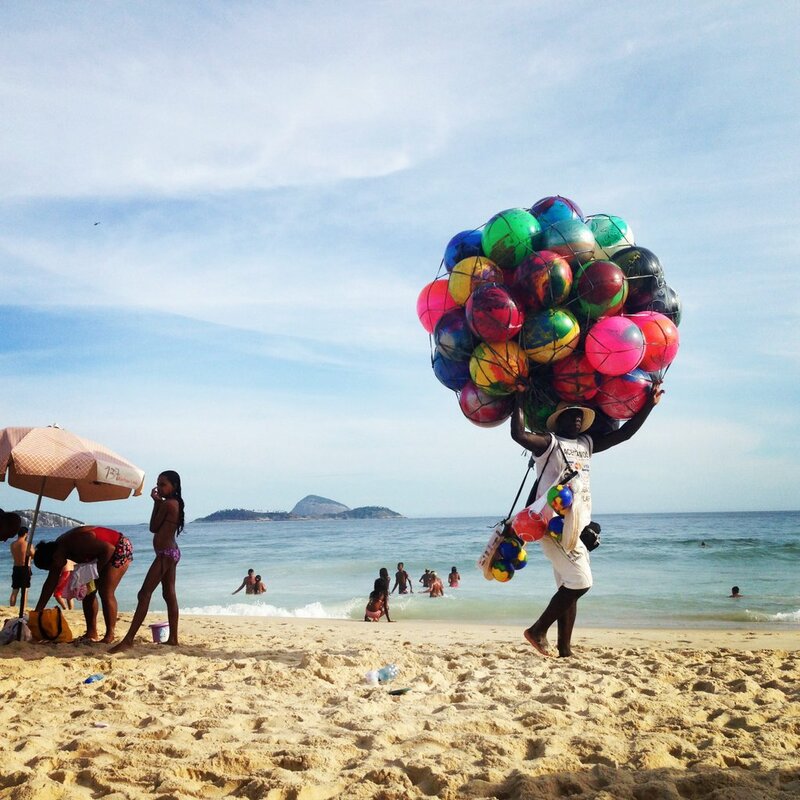 It is located in the centre of Rio and is famous for its historical monuments and nightlife. The neighbourhood is home to the Arcos da Lapa, an impressive aqueduct constructed in the mid-18th century by colonial authorities. Another important historical attraction is the Passeio Público, the first public park of the city, built in the 1780s. Since the early 1950s, Lapa has been known for its lively cultural life, concentrating many restaurants and bars where Brazilian artists and intellectuals used to meet. 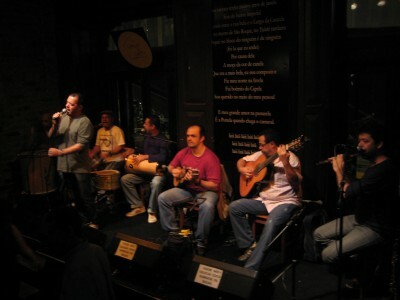 It was, and still is, famous for its many restaurants, bars and clubs where the various forms of Brazilian music can be appreciated, like the Asa Branca bar and the Fundição Progresso. The Sala Cecília Meirelles, an important venue for chamber music, is also located in Lapa. 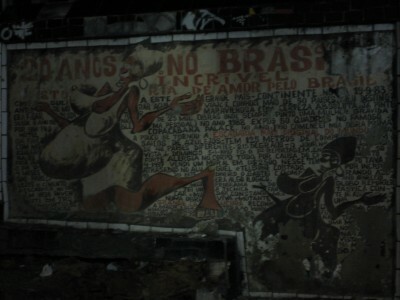 This was my first venture outside of the bairros of Zona Sul. Andy and David (friends from Emory) are in town for 5 weeks an got in tonight. We met in Copa for dinner and drinks (passionfruit caipirhinas -sigh) with some of the grad students in the program and then against my better judgement (it was a school night!) 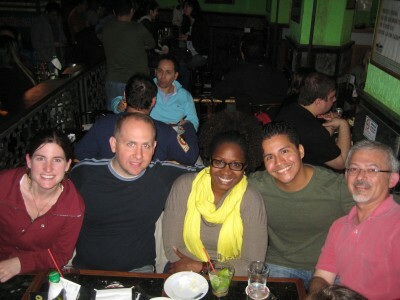 I went with them to LAPA. I am so glad I did! 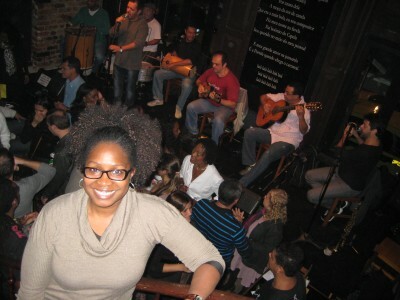 We had awesome seats, heard amazing music (classic samba) by [EDIT] Toninho Geraes at Carioca da Gema (CLICK IT! ), and I met a samba singer, Thais Macedo, who had amazing hair and who offered samba lessons for english lessons. Score! I obviously have heard samba before, but my iTunes had nothing compared to the live experience I just had. AMAZING. You should have seen the crowd. Here I saw for the first time the notion of Brazil having no race and also here for the first time I spied all the fine a$$ men everyone was talking about! Sweet Lord they are beautiful (SMH and fanning myself)! OK-I get it. Samba, sweat, and sexiness–yep. I had an awesome night…thanks Andy and David!! Band is Toninho Geraes! Obrigado pela correção Thais!